Children in Schools and Licensed Child Care Settings Protocol, 2018. Public health also assesses immunizations as outlined in the Child Care and Early Years Act, 2014 (CCEYA), for children enrolled in childcare programs according to the Immunization for Children in Schools and Licensed Child Care Settings Protocol, 2018. In 2017/2018, immunization records for enrollee’s of 61 licensed childcare centres were assessed and 861 immunization notices for incomplete records were distributed. In the 2017/2018 school year, Wellington-Dufferin-Guelph Public Health (WDGPH) sent 6,598 immunization notices to students or parents of these students, aged 4-17 years old who did not have up-to-date immunization records. Most students updated their records prior to the deadline and only 962 suspension orders were enforced. 249 Statement of Conscience or Religious Belief (SOC) exemptions were applied in the 2017/2018 school year. 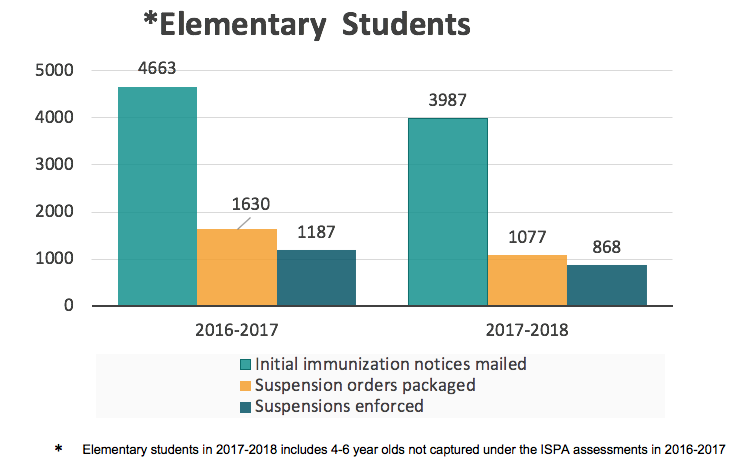 The assessment of immunization records and suspension of students who did not meet ISPA requirements remains an effective way to improve immunization rates and accuracy of records. November 2017: 6,598 letters were distributed to students/parents/guardians informing them that WDGPH did not have their complete immunization records. 3,226 ISPA mandated immunizations were provided. 249 conscience or religious belief exemptions were filed. 962 suspensions were enforced. Over 95% of suspended students were back to school within a week. January 2 - April 9, 2018: Public Health Nurses fielded 2,788 calls and provided support on the VDP help line. There were 1,432 outgoing calls and 1,356 incoming calls. WDGPH will encourage the use of our new online tool to report immunizations and to view/print records. Immunization records of all students will be assessed in the 2018/19 school year. Students between age 4 and 17 with incomplete records will be notified this fall. Secondary school students who have not reported their immunizations to public health will be suspended in February. Elementary school students with incomplete immunization records will be suspended in March. In 2017/18 there were 6,598 students with outstanding records or overdue vaccines at the beginning of the school year. In 2018/19 it is estimated that 4.800 students will have outstanding records or overdue vaccines at the beginning of the school year. The 2017/2018 school year is the second year WDGPH has assessed the records for all children enrolled in schools and licensed childcare centres. The age range for assessments under the ISPA was expanded from 7-17 year old students to 4-17 year old students in order to align with the requirements of the Immunization for Children in Schools and Licensed Child Care Settings Protocol, 2018. Children between the ages of 4-17 enrolled in school were assessed under the Immunization of School Pupils Act (ISPA) while children ages 0-3 in licensed childcare were assessed under the Child Care & Early Years Act (CCEYA). Children assessed under the ISPA are suspended from school for non-compliance, whereas children assessed under the CCEYA are encouraged to update records.1 Public health does not suspend children from licensed childcare centres for incomplete records, but childcare centre operators can deny children access to the centre until records are provided. Assessing immunization records of all students has resulted in ongoing opportunities for collaboration with school boards and childcare centre operators. Extensive interactions between public health nurses (PHNs), students and parents allows opportunity for education about vaccines and vaccine preventable diseases. The addition of licensed childcare assessments informs parents of the importance of maintaining up-to-date immunizations and records prior to their child(ren) entering the school system. Comprehensive assessments and suspensions assist WDGPH in obtaining accurate immunization coverage data for our communities, informing programs and practice. Ongoing communication with school boards, school staff, licensed childcare providers, healthcare providers and the public is integral in reinforcing the message that public health is committed to annually assessing immunization records. Each school and licensed childcare centre was partnered directly with a PHN for a direct point of contact during the assessment and suspension process. The Vaccine Preventable Disease (VPD) team maintains the live-answer intake line where anyone can access immediate support from a PHN. Negative impact on community relationships is a key risk for WDGPH when enforcing the ISPA. WDGPH continues to reiterate the role of the schools, and the responsibilities of the parents/guardians and students in their obligation to be fully immunized for school attendance. Physician offices also experience the impact of increased numbers of clients asking for their immunizations to be updated or records sent to public health. WDGPH encourages healthcare providers to regularly report immunizations given to their daycare and school-age clients in order to maintain an accurate record and decrease the number of calls to physican’s offices. Board of Health (BOH) members are encouraged to support efforts with community stakeholders to be immunized and maintain an accurate record of immunizations, thereby supporting the efforts of public health to protect the community from vaccine-preventable diseases. BOH members can also alert WDGPH to any concerns they hear from their constituency or community members in the 2018/2019 school year. Ontario’s Immunization of School Pupils Act (ISPA) currently requires that parents of children enrolled in school provide their local Medical Officer of Health with proof of their child’s immunization against designated diseases.1 Public health units are required to assess immunization records and notify those with incomplete immunization records. Exemptions from immunization requirements are allowed for medical reasons, or can be based on a Statement of Conscience or Religious belief (SOC).1 On September 1, 2017, the ISPA was amended to require parents seeking an SOC exemption to also complete an immunization education session at their local public health unit. Students without required immunization records or a valid exemption may be suspended from school until the required records are provided to public health.1 WDGPH ensures ample opportunities to provide the required information and avoid suspension from school. During the 2017/2018 school year, the immunizations of all Wellington-Dufferin-Guelph students in public, private and catholic schools were assessed. Some mennonite schools previously excluded from the process were incorporated into the mainstream process, dependent on a risk assessment and communication with school administration. The parochial schools continue to be assessed for incomplete records, but children are not suspended from these schools for several reasons. WDGPH considers many of these children at risk of not returning to school if a suspension is enforced and these children already experience barriers to education. Additional efforts are made for these students to follow-up with incomplete records and provide opportunities for immunization. In November 2017, 6,598 letters were distributed to students/parents/guardians informing them that WDGPH did not have their complete immunization records. These letters also included the student’s overdue vaccinations and instructions for submitting records, along with a deadline for submission. WDGPH provided immunization clinics in each secondary school to provide students with easy access to immunization services. Additional WDGPH clinics, including after hours appointments, were offered to accommodate the volume of students requiring updated immunizations. Parents and students were sufficiently warned that failing to update their immunization records could result in suspension. Feedback from stakeholders was considered and incorporated into the notification and suspension process to help decrease unnecessary suspensions. Figures 1 and 2 provide a comparision of suspension data collected over the past two years. Initial immunization notices are sent out in the fall term of the school year so that parents and students with incomplete records and/or immunizations have ample opportunity to have this completed. A deadline for updating records is included in the notification. The deadline is several days prior to the suspension date to allow WDGPH an opportunity to process the increased volume of last-minute records submitted. During the period between the deadline and the designated suspension day, suspension orders are prepared, packaged and delivered to each school. On the day of suspension an updated list is provided to each principal, omitting the students who have had records processed after the deadline, excluding them from being suspended. Elementary students in 2017-2018 includes 4-6 year olds not captured under the ISPA assessments in 2016-2017. For the 2017/2018 school year, WDGPH implemented a number of activities and improved processes to decrease time wasted and improve work flow. Opportunities to improve client satisfaction were sought out and applied. Immunization notices were mailed directly to the student’s home address to ensure that the notification was not overlooked in a backpack. 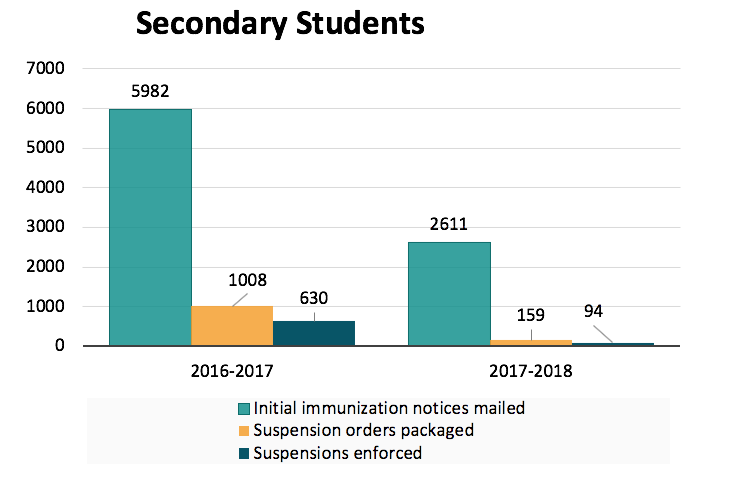 The assessment and suspension timeline allowed up to eight weeks (with a minimum of four weeks) for students with incomplete immunization records to become up to date before the deadline. From December 1, 2017 to May 1, 2018, WDGPH nurses provided 3,226 ISPA required immunizations to children under 18 years of age. Prior to secondary school suspensions, nurses offered immunization clinics at each secondary school. Robo-calling software was implemented as an additional method of notification, using the primary phone number parents provided to their school. A friendly phone call was initiated for each student/family with outstanding records along with information regarding upcoming clinics. The VPD program maintained a live answer phone system in order to offer timely immunization advice and assistance. nurses answered 1,356 incoming calls and provided support via 1,432 outgoing calls on the VPD phone line from January 2 to April 9, 2018. A “blue card” system (back to school pass) was implemented internally to compensate for records processing backlog in order to ensure no student was unnecessarily missing school. Students identified as “at risk” for other adverse life events if unable to attend school were not suspended. Nurses worked closely with school staff to identify these students. Once identified, these families were contacted and offered support in accessing immunization or submitting records or creating an individualized follow-up plan. In cases where students were suspended for more than a week, nurses followed up with the principals and families to implement a plan to help these students update their records and return to school as soon as possible. Nurses regularly contacted students or families of the students who did not submit records prior to the deadline and throughout the suspension period of 20 days to offer support and assistance. Under the CCEYA, child care centre operators are required to follow the immunization recommendations made by the local Medical Officer of Health, for staff and enrollees of child care centres. Staff and enrollees are required to have a notarized SOC exemption completed if they refuse a vaccination for religious or philosophical reasons. Medical exemptions can also be obtained where appropriate. The Immunization for Children in Schools and Licensed Child Care Settings Protocol, 2018, requires public health to collect annual enrollment lists from 61 licensed centres and review immunizations records. In 2018, 3,041 records were assessed for 0-3 year olds who are not yet enrolled in school and therefore not assessed under the ISPA. Following the assessment, 861 children who were not immunized according to Ontario’s publicly funded schedule were advised to contact their physician for recommended vaccines or submit an updated record. The Ministry of Education reviews staff immunization records and exemptions routinely as part of the licence and inspection process. Child care operators are required to keep records for staff and children on file. Child care centres can exclude a child from the centre for incomplete records, however, WDGPH does not play a role in this process unless in the event of a vaccine preventable disease outbreak. In preparation for the 2018/2019 school year, all web-based content, letters, templates and exemption packages are have been updated. WDGPH messaging will continue to reinforce that any parent/guardian of a child under 18 years old, and attending a licensed childcare centre or a school in Ontario should inform their local public health agency every time a vaccine is received. The immunization records that are submitted will continue to be assessed as mandated, and suspension will be initiated as required. School boards and WDGPH have collaborated to encourage all new students to report vaccines directly to WDGPH rather than submit records via the school. This eliminates third party record handling and reduces administrative time allowing for other value-added activities. Report immunizations received or an immunization record for a child under the age of 18 to WDGPH. Access and/or print this information when a child needs emergency treatment or when they register a child for summer camp or other recreational programs. Preventing sporadic cases of disease from spreading into vaccine preventable disease outbreaks is both time-consuming and a strain on healthcare resources. There are great benefits for both individuals and the community when effective vaccine coverage rates are maintained. The ISPA and CCEYA required assessment activities are effective at increasing immunization rates and improving accuracy of records. In several cases, families did not update their child’s records because the child was not attending school at that time. If the student was not currently attending school or was out of the country, there was little incentive to report immunizations to WDGPH. WDGPH continues to experience some challenges during the assessment and suspension process, however, the process has been streamlined and improved over the past two years. WDGPH recognizes the increased workload for local healthcare providers who accommodate immunizations for students with outstanding records and report immunizations provided to WDGPH on a regular basis. Feedback from community partners and WDGPH staff was considered and incorporated into planning. Overall, feedback regarding the collaboration between schools and WDGPH for the ISPA activities is increasingly positive. For the 2018/2019 school year, WDGPH will work to increase the communication and collaboration with licensed childcare providers. Goal: To reduce or eliminate the burden of vaccine preventable diseases. There is reduced incidence of vaccine preventable diseases. Target coverage rates for vaccine preventable diseases are achieved. There is increased healthcare provider knowledge of immunization. There is increased public knowledge of immunization. There is improved effectiveness of publicly funded immunization programs. Immunization rates for vaccine preventable diseases are a recognized health equity concern. Families with fewer social and economic resources are more likely to have children that are not fully immunized.2 To accommodate families who may need extra time to access immunizations or submit records, the assessment and suspension timeline allowed a minimum of four weeks for students with incomplete immunization records to become up-to-date before suspending students. Nurses also worked closely with school staff to identify students who could have been at risk for adverse events if unable to attend school. These families were contacted and offered support in accessing immunization or submitting records. WDGPH also expanded the assessment process for all young children enrolled in licensed childcare centres. Incomplete records for this age group were recorded and notifications distributed in order to provide these parents with ample time to receive the required immunizations prior to the risk of suspension from school. Several parochial and small private schools were identified as having increased numbers of students at greater risk of dropping out of school entirely, if suspended. Although these students were notified of incomplete records, no students were suspended but had individualized plans created to get them up-to-date. We continue to work toward having zero students with incomplete records in these schools.